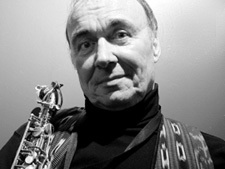 Rusty Bryant was an authoritative voice of the tenor and alto saxophones. Because of his love for Columbus, Ohio he never ventured very far from that city, where he was a local musical hero. He usually went to New York or L.A. only to record. He had some recorded successes in the mid-50's where he displayed a smooth style and a light Getz-like tone but stayed around Columbus and was rediscovered by Prestige Records and offered a contract. By this time he had changed his style to a more bluesy full-bodied sound and concept and worked in a more funky context usually with a Hammond organ. In his series of discs for Prestige we present his best and his best-selling album called "Soul Liberation"
Rusty surrounds himself with some great players like Virgil Jones on trumpet, Melvin Sparks on guitar, Charles (The Mighty Burner) Earland on organ and the great Idris Muhammad on drums. Rusty sticks to the tenor on 4 of the 5 tunes one of which is written by Eddie Harris called "Cold Duck Time" two tunes by organist Earland and one straight blues by Rusty and finally Rusty's tribute, played on the alto saxophone to a cousin who was killed in Viet Nam called "The Ballad of Oren Bliss". "Soul Liberation" is earthy, funky and great for listening and if the spirit moves you....dancing. Kenny Dorham · Live at "The Flamboyan"